I spoke to the Times Weather reporter, Paul Simons, this morning to discuss the effect of this long dry spell on sea trout runs. He was particularly interested in whether the late sea trout run in Island of Mull rivers may be connected to low water. I said that I thought that low flows may contribute, but that there are other factors at play on the west coast, most notably the unknown impact of salmon farm generated sea lice on run timings of sea trout – and of course climate change and its effects on sea temperature. On the east coast, and on the South Esk in particular, I note that our sea trout continue to run, albeit in relatively small numbers at present. There is certainly sufficient flow to bring small packets of fish upriver pool by pool, which accounts for the flashes of silver we see in the deep pools throughout these bright sunny days. People tell me that sea trout and grilse will run on wet blotting paper! There are plenty of fish about, but they are nearly impossible to catch. High water temperature and very low water make life very difficult for the night sea trout fisher, despite the fact that we have more sea trout in our pools than for many years. Fish deep and slow in the darkest moments of these short nights. Paul Simons (the Times Weather man) told me to expect substantial rain overnight on Thursday and well into Friday, with a good chance of continuing rain all next week. We won’t blame him if he is proved wrong but we do like his optimism! Tight lines to all our fishers, especially Martin Busk and his guests next weeek who are fishing three beats all week. I’m off to the Scone Game Fair. Come and see me on the AST stand. The last fortnight has been hard work for Finavon’s night sea trout fishers. As the water level has dropped, and the water temperature increased, resident sea trout have become reluctant to take the fly, except late at night or very early in the first light of dawn. 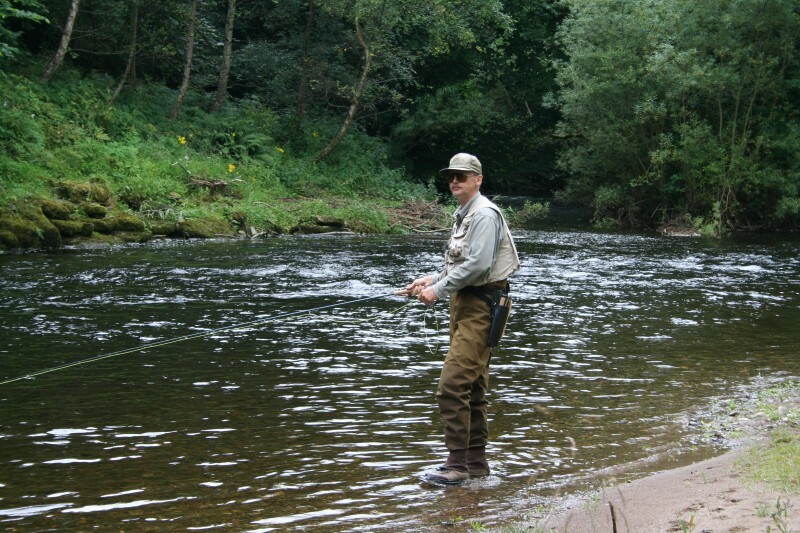 Every pool has sea trout and the big holding pools – Indies, Tollmuir, Melgund, Red Brae and Boat Pool – have shoals of sea trout ranging in size from 1lb to well over 5 lbs. It is therefore not surprising that Ian Ingledew had a beautiful sea trout of 5lbs 4oz from red Brae on Friday 25/6. Two other smaller fish were also caught during the same night. I fished Boat Pool, Volcano and Willows with my brother, John. We saw lots of fish: in fact there was barely a moment when the surface of these quiet pools wasn’t being disturbed by shoal sea trout, some big fish amongst them, moving sub surface. But neither of us had so much as a nudge. These are the numbers of fish for which the South Esk is justly famous and it is great to see them back. It is also worth noting that all sea trout caught this year have been in prime condition. It seems that there is plenty of food for them along the east coast. Let’s hope it stays that way. Let’s also start practising our rain dance numbers as the farmers plug in their crop irrigators and drain our already parched river still further. A few days of rain would please the farmers and us by watering thirsty crops of potatoes and barley, refreshing the stock of fish in the river, not to mention bringing in new stock. But, as always, clouds and rain wouldn’t please everyone. Last week we caught 21 sea trout, amongst which were three nearer 5lbs than 4lbs. These fish are fresh-run and in the pink of condition. In fact, as an experienced sea trout night fisher myself, I can say that these sea trout are as good as I have ever seen them in the South Esk. That tells me that they are well fed, and that clearly there is no shortage of zoo plankton, sand eels and the other marine prey species so important to coastal zone-feeding sea trout. 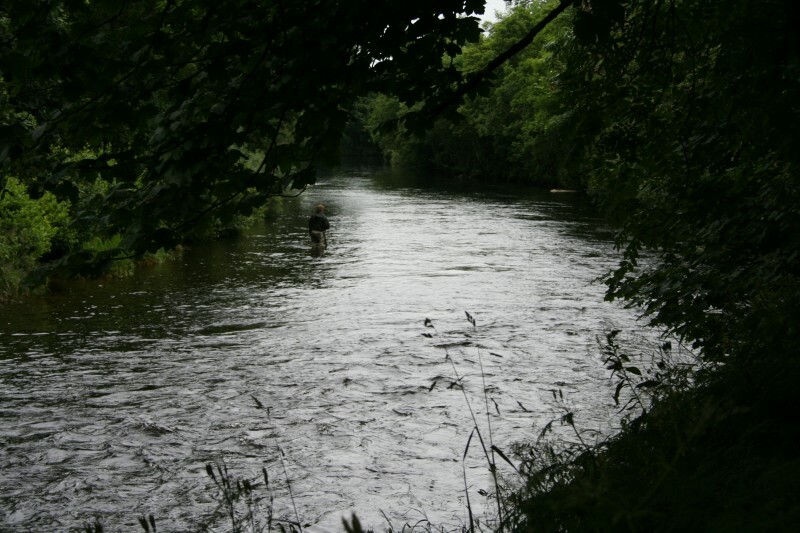 It is hugely important to the South Esk, by repute in the top three of Scotland’s sea trout rivers, that good stocks of sea trout can provide an alternative target species for anglers concerned about the declining abundance of Atlantic salmon. Just after midnight on Saturday I called in at Indies to see Alastair Young and his companion before they left the River to return home in East Lothian. Alastair was delighted to have caught two sea trout in the Steps, downstream of Tollmuir Pool and just above Marcus House Pool. The first was a nice fresh sea trout of close to 2lbs, but the next one was a real cracker at 4lbs 8oz. Alastair told me that the second fish was in prime condition and “fought like a ten pound salmon”. Both fish were returned alive to continue their upstream migration. “Just the one fish landed last night – a sea trout of 2lbs. Took a few yards down and off the big stones sticking out into the Bridge pool. #10 S. Stoat variant. Dour fish, little aerial intent and a lot of boring down; all the same didn’t give up in a hurry. Landed Fish was not released – had tried to swallow hook, took a lot of removing and I couldn’t get hook out in the water. Fish badly distressed, knock on the head seemed kindest. I’ve seen fresher but no sign of colouring. Lost a 2nd more acrobatic one of similar size further down Bridge, perhaps fresher – from its behaviour. Further confirms you’ve got fish top-to-bottom. About 30 mins after you left I wandered down to Boat leaving Willows undisturbed. Wasn’t sure where to go into Willows now – and was a bit too tired to go adventuring in the dark. I was a silly boy not stopping to see where you were beginning down there. Some huge splashes in Willows while passing – was tempting, but you can catch them tonight. Fished upper boat from some yards above Volcano and then down through Lower Boat – as Mike showed me. Good few tugs down the stretch and one lost somewhere just above Volcano itself. Splashes down that stretch was smaller than in Willows – I’m working out that the latter is THE pool to fish for ST! Having left Murray some nice flies in tree on far side of Lower Boat, I decided this meant it was probably bed-time! Forgot to say earlier – I had one decent tug around bottom of first concrete wall of Red Braes as well as the good number of splashes I noted earlier”.